Little Jamboree | Playgroup and Kindergarten : Did you know? 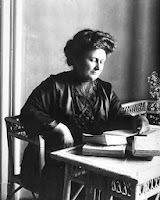 The Montessori method is an educational method for children, based on theories of child development originated by Italian educator Maria Montessori in the late 19th and early 20th century. Although there are many schools which use the name "Montessori," the word itself is not recognized as a trademark, nor is it associated with a single specific organization.